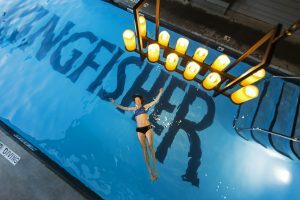 The Kingfisher Resort & Spa is many great things rolled into one tidy package—boutique beach resort, destination spa, yoga retreat and top-rated restaurant. 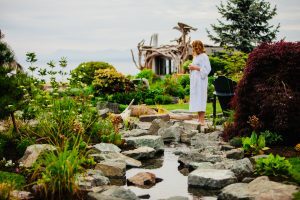 Guests can sink into soothing hands at the spa, realign with a yoga class, take a dip in the outdoor pool, breathe in the lavender-scented sea air, watch the boats cruise around the Gulf Islands or sit in a garden chair and do nothing at all. Vancouver Island’s gorgeous eastern coastline sets the scene here, with breathtaking views of Comox across the bay and a few Georgia Strait islands off in the mist with the mountains and Sunshine Coast beyond. 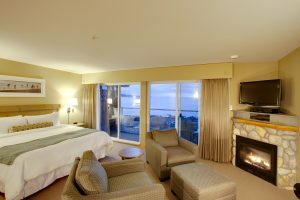 The resort is on coastal Highway 19A, an hour north of Nanaimo and 10 minutes from Courtenay. Special occasion celebrants, weekend-away couples and small groups of friends all check in to put their feet up for a few days, relax at the spa, take advantage of the full yoga schedule at Starfish Studio and tuck into fabulous meals. 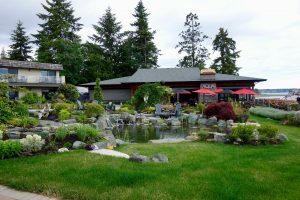 The restaurant and spa are destination spots for locals, too, which makes the mixed-company mix more interesting. Rooms have heated bathroom floors! Contemporary West Coast goodness can be found in Ocean7, a fine-dining restaurant that hits all the local and sustainable notes with a focus on seafood, grain-fed meats and organic produce. 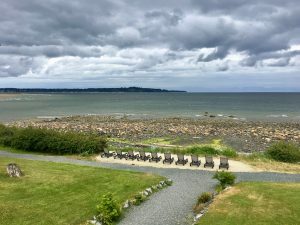 The view is spectacular, made even more natural by the moss-covered, driftwood strewn rooftops of the oceanfront buildings—such a cool idea. The adjacent AQUA Bistro & Wine Bar serves more casual fare and opens up onto an expansive patio overlooking a charming, tailored courtyard garden complete with gas fire pits. The restaurant and the service is superb, but the Pacific Mist Spa is the real draw here, newly renovated and reopened with rainfall showers and Italian-tiled everything, an upgraded pool and an infrared sauna. The signature highlight is the Pacific Mist Hydropath, a detoxifying hydrotherapy circuit designed like an underground cave with eight different elements, including mineral pools, waterfalls (hot and cold), a steam room and a salt-scrub tub. We found standard rooms from C$140 ($105). Doug stayed as a guest of the hotel. The hotel did not have editorial approval.